It is replaced by the Motorola MT2000 Series. The P360 memory scanners are rugged, high-performance devices designed to minimize fatigue in scan-intensive applications. These batch data collection tools allow you to collect data (up to 53,000 barcodes) while freely roaming the premises for up to 12 hours. To download data, simply drop the P360 into the cradle connected to the host. The P360 also operates in a corded mode when cabled to a host. 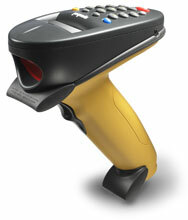 What's more, these scanners ship with a free inventory application already installed enabling users to store barcode data, manually key in alphanumeric data and quantities right out of the box. You can also review and delete existing records using the top-mounted keypad and display. Sealed to IP54 standards, the P360 is suited for extreme environments and withstands multiple 6 ft. drops to concrete, making it ideal for warehouse, yard or loading dock applications. All units ship with one product reference guide. Scanner. Includes 2-line, 20-character display, 4MB flash, standard 17 key keypad, battery, product reference guide, & Link-Lite software. Order cradle, cradle-to-host cable, & power supply separately. See accessories. Kit: Scanner with 2-line, 20-character display, 4MB flash, standard 17 key keypad, cradle, power supply, battery, product reference guide, & Link-Lite software. Order cradle-to-host cables & line cord separately. See accessories. Kit: Scanner with 2-line, 20-character display, 4MB flash, standard 17 key keypad, cradle, power supply, battery, product reference guide, & Link-Lite software. Order cradle-to-host cables separately. See accessories. The HP360-Li is a direct replacement for the OEM Part Number 50-14000-145 and KT-BTYPL-01 batteries used in the Symbol Phaser series handheld scanners. Universal Power supply, 9v D/C, 100-250v AC. Requires Line Cord (Part# 50-16000-182R).